A Freaks event is a great way to dip your toe into morris dancing for the first time. We're really relaxed and friendly, and we aren't really in it to be uptight about how well we dance. We enjoy dancing and we enjoy sharing the tradition with other people, so you are very welcome to come along even if you've never danced before. We meet four times a year in various villages around the Peak District (or somewhere more distant if we're feeling adventurous.) Anyone is welcome to plan a Freaks event, we have guidelines as to what's involved here. There are core planning members, so if you want to plan one, best maybe get in touch with one of them. Elmo will do as a first point of contact. We usually meet up on the Friday night for a music (and beer-drinking) session in the local pub. Feel free to bring a musical instrument or your singing voice, but also feel free just to listen. We usually start to arrive about 8, and can be spotted either by our Freaks t-shirts or our generally folky appearance. If in doubt ask someone whether they're a Freak and if you get a blank stare or a slap, it's not us. There is always someplace to sleep, usually "indoor camping" (bring some padding, a sleeping bag and pillow) in a village hall, but at some Summer events there will be only outdoor camping. The events page will say what the options are, usually including a few B&B options for the faint or heart. Though sometimes we don't get round to putting details up until a week or two before the event. Sorry. On the Saturday morning we have a "workshop" at which Elmo (or whoever else feels up to it) teaches the dances in our repertoire. 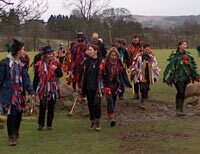 These are traditional border morris dances and are not too challenging if you have any dancing experience. If you have no dancing experience, fear not, we don't expect you to learn them properly in one 3-hour session, just to have a go and see how you like it. If you like it enough to come back again, you'll learn them a bit better each time and eventually you'll know them all. Saturday afternoon we do a bit of a pub crawl round the village doing the dances from the workshop. You can have a go even if you didn't learn them perfectly, it's all about having fun and not at all about worrying that you're getting it wrong. Just try not to hit anybody's knuckles with your stick. We wear rag jackets for the dancing out, and we usually have one or two spares around for people who don't have their own. However, if you're really keen, you can make one. Just buy an oversize men's shirt from a charity shop and cut up whatever old fabrics (or new fabrics if you're swish) into rags and sew them on. It's easiest to do this if you draw horizontal lines on the shirt first and then sew the rags along these lines starting at the bottom. Ask Elmo for further advice if you need it. Saturday evening we frequently do some kind of communal cooking in the village hall, though there are also meals available at the pub. If you want to be in on the meal, just bring (or buy locally) some veg of some sort. These meals are usually vegetarian and always really convivial. Saturday night we try to either get the function room of one of the local pubs or set up the village hall for an evening of music and dancing. We play whatever tunes and do whatever dancing we feel like, but you can expect to see some other performance dancing (cotswold, molly, etc.) as well as some social dances (ceilidh/barn dancing, french, israeli, occasionally swedish, whatever.) and toward the end of the evening we frequently do a bit of singing. If you're very lucky, John will get out his fishwife outfit and his guitar. On the Sunday, we have a countryside walk to the next village to dance at thier pub (where lunch is available) and usually get back to the village hall around 4 in the afternoon. We love it when people stick around to help tidy up the hall. You can come to as much or as little of the event as you like, and you can just watch if you are uncomfortable taking part, but be prepared for people to continually encourage you to take part, we can't help it, we find it so much fun that we want to share. Please don't forget to pay your £4 attendance fee, even if you don't come for the whole weekend. It's a modest fee, and we need it to be able to book halls and pub function rooms, etc. Freaks in the Peaks is a member of Open Morris and we are insured under thier scheme, so if you have paid (on the Saturday morning) for your attendance, you are covered by our insurance. Not that morris dancing is dangerous. Mind your knuckles though. So, welcome to Freaks and we wish you many year of happy dancing.